These two articles are very close to the truth, but unfortunately they cannot depart from the hugely wrong assumption that the Israelite were in Egypt. While the truth is they went and stayed in Ethiopia for more than 400 years and they never went to Egypt. The Biblical Exodus was from Ethiopia NOT Egypt. The Israelite are actually a small old Yemeni Arab tribe. 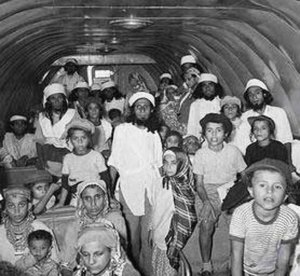 The Turkic Jews thought that operations like “Magic Carpet” in 1949 for Yemen, and “Moses”, “Joshua”, and “Solomon” in 1979-1990 for Ethiopia will erase the history of Hebrew Semite Israelite. Turkic Jews consider any trace of Hebrew Semite Israelite history as a major security, political, and cultural threat. Turkic Jews are keen to follow behind any Israelite traces and groups to eradicate any history wherever the Israelite went. Sudan, Somalia, and Libya could be added to the list. It came to my attention a very informative book “Mission archéologique dans le Yemen (1872), by Joseph Halévy (15 December 1827, Adrianople – 21 January 1917, Paris). He was an Ottoman born Jewish-French Orientalist and traveler.”. It shows that Turkic Ottomans were surveying Yemen and Ethiopia to select a home for Turkic Jews. Joseph Halévy was assisted by a Yemeni Israelite who also wrote a book about his experience with Joseph Halévy. Archaeological missions to Yemen, namely the record of Hayim Habashoush, Hayim bin Yahya bin Salem al-Fataihi. His book is “Vision/Investigation of Yemen” 1311 AH -1893 AD, it was translated to Arabic by Samia Naim Sunbar. MOSES IN THE YEMEN, Anatomy of a Discovery. In recent years there has been much discussion as to whether Mt. Sinai was actually located in the Sinai peninsula or in Midian which is in modern day Saudi Arabia. The idea is not a new one; Beke1 first published (posthumously) the possibility in 1878 more importantly Lucas of “Ancient Egyptian Materials and Industry” fame in a wonderful book published in 19382 made a compelling argument for the thesis. Along comes Ron Wyatt who takes the thesis and goes on an adventure to Jebel Al-Lauz in the Tobuk area of North Western Saudi Arabia and finds a mountain with a black top and a few artifacts which is enough for him to claim that he has found Mt. Sinai. He was followed by two other adventurers, Larry Williams and Bob Cornuke who without citing Wyatt (plagerism???? Its difficult to tell as none of the books published have an index) go to the same site and come to the same conclusion. They have found Mt. Sinai3. A number of critiques have been published on the thesis but only one criticism resonated with me and that was the suggestion that it was more than 11 days away from Kadesh Barnea according to the Biblical account. That of course presupposes that we knew where Kadesh Barnea is and that the present identification in the Negev at Ain el Qudeirat4 is the correct one. I had already decided to do a television special on “The Exodus” including the Wyatt thesis and I knew a little of the Exodus and therefore whilst I was sympathetic to the notion that Mt. Sinai was in Saudi Arabia, I believed that it must have been a volcano and Jebel Al Lawz whilst it had a black top, was not one. It also seemed likely from the quote that starts this piece, that there was at least one and probably a string of volcanoes on the route of the Exodus. How else to explain the phenomenon described? I therefore started to search for two things. A high mountain in Arabia that was a volcano and that fit the specifications of Mt. Sinai. How did we work before the internet. Within a few minutes…………. Bingo, I had found this map which seemed to be a promising start. 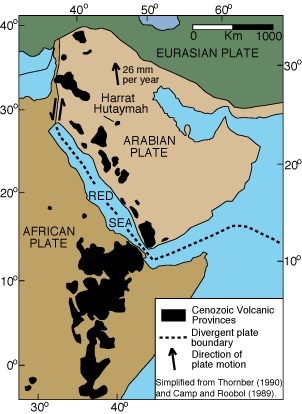 There was an almost straight tectonic line from Yemen to “Canaan”. Now to find Mt. Sinai or Mt. Horeb as it is also known in the Bible5. Those who understand linguistics know that both Hebrew and Arabic words are based on three letter roots (without vowels), thus hrb for Horeb and that there is a process known as metathesis where occasionally translations from one language to another involve changing the order of the letters say to rbh, or brh etc. 17 volcanic sites are listed in Arabia only two with an elevation above 3,000. Harra of Arhab at 3,100. Not for the first time in my career of investigating was I speechless. “RHB” “HRB”. The same. A tall volcano that fit the physical requirements of Mt. Horeb perfectly but where was it………. IN YEMEN. My skepticism was increased by the fact that I knew of no way the Israelites could have arrived there and eleven days journey to Kadesh Barnea seemed utterly impossible. I then remembered a book by Professor Kamal Salibi6 which I had read when it first came out and dismissed as being totally unrealistic. I had been in touch with Kamal over the years and I unearthed the book from my library to see if there were other identifications between the Hebrew and the Arabic along the tectonic plate. On page 41 is a map of the area in which Professor Salibi believes the whole Biblical story of the children of Israel originates. The area of Asir (Seir) is in Western Saudi Arabia. Two things immediately stood out. There was a place “Rofiydan” in the South near the Yemeni border on the route north running parallel to the tectonic line. That immediately brought to mind the Hebrew “Rephidim” one of the camping stops along the route of the Exodus. Much further north, again on the tectonic line was a place called “Bani Amr” (the tribe of Amr). This in Asir (Seir). That immediately brought to mind the attack by the Ammorite in the vicinity of Mt. Seir an event that also took place during the Exodus. Now we were getting somewhere, albeit with the aid of a book that has been totally discounted by the academic community. I needed to find another location for Kadesh Barnea. Whilst Kadesh is a common Hebrew word meaning “holy” the word Barnea is totally unknown. Salibi suggests that it could be referring to a god “rn” so the site could be one dedicated to that god. Hebrew scholars have no thoughts on the subject. Where does Velikovsky place Kadesh Barnea, in the most unlikely place of all for a Jewish biblical scholar? MECCA!!! For him (and perhaps for me) it made perfect sense. What was the holiest site in Western Arabia, Mecca? The story gets even stranger. As usual for Velikovsky, his writings are always meticulously (if not always accurately) footnoted. Kadesh Barnea in the Biblical account7 is located in the desert of Pharan (Paran)……. (note the “rn” again). Velikovsky states that “according to the old Arabian sources” Pharan is in the mountainous area of the Hijaz. There is a reference to a footnote 17. The problem is in his paper, footnote 17 is missing. What to do? Where is Mecca on our grand scheme of things, again very near the fault line on the way from Yemen to Canaan? I contacted Salibi again. He dismissed my ideas about Mt. Horeb in Yemen and Kadesh Barnea as Mecca (on the grounds that it was too arid, but in fact there are fresh springs in the area and 2,500 years ago, the area could well have been lush) but did identify the 12 camping spots mentioned in Numbers 33 as being the exact equivalents of sites in Asir. Had I stumbled on the real route of the Exodus? What did the route that I had mapped out look like? Bigger mysteries remain. 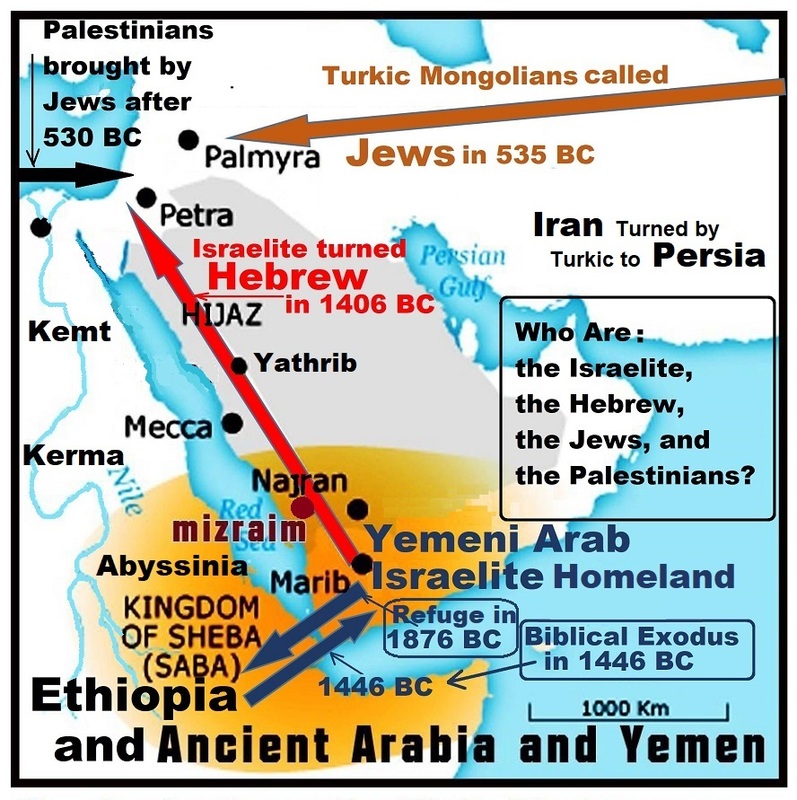 How did the Israelites get to Yemen and how did the idea that it took 11 days from Mt. Sinai to Kadesh Barnea get sorted out. With the help of our wonderful cartographer Linda, we will show you in the next few weeks. Al Quds (qds in both Arabic and Hebrew means Holy) is Jerusalem in Arabic: Now Mecca (Islam’s Holiest City) may very well turn out to be the long lost city of Kadesh (qds) Barnea. A major Jewish holy City, lost for 3,500 years. “My book is merely exposing the forgery linked to the Septuagint Greek translation of the Hebrew tales (never should have been called Bible by the way). My book is debunking the ancient Israelite stories ever happened on Egyptian soil, most of all Moses and Pharaoh Story (a huge claim many scholars know is true but they prefer, out of fears for their own safety, to whisper about it behind closed doors) But I don’t get paid (by Biblically intoxicated institutions) nor abide by Zionist paradigms in my work, like most Egyptologists, so why the hell should I join the whispering chickens’ club. “Following 70 years of intensive excavations in the Land of Israel, archaeologists have found out: The patriarchs’ acts are legendary stories, we did not sojourn in Egypt or make an exodus, and we did not conquer the land. Neither is there any mention of the empire of David and Solomon. Those who take an interest have known these facts for years, but Israel is a stubborn people and doesn’t want to hear about it” … excerpt from a feature article By Prof. Ze’ev Herzog. Herzog teaches in the Department of Archaeology and Ancient Near Eastern Studies at Tel Aviv University. The scholars of history, anthropology, philology and ancient mythology who revealed, through scholarly investigations, that ancient Arabia and Yemen was the homeland of the Israelite stories and whose scholarly investigations are also cited in my book are; Dr. Fadel el-Rubaie, Dr. Kamal Salibi, Dr. Ahmed Dawood, Dr. ziad Mouna and Dr. Bernard Leeman. Leeman, an acclaimed authority on Eastern African history argues that “the Old Testament is an accurate record but the events it describes prior to 586 BC took place not in Palestine but in Western Arabia, and to a lesser extent in Eretria and Ethiopia. I’ve also revealed through my own research and investigation, that ancient Egypt never had any so called Pharaohs. In my research I’ve dug deep into ancient Egyptian history, culture and mythology. I’ve even traced back the etymology of ‘Egypt’ as the name of the Nile Valley to pre-dynastic times . As stated in the final (conclusion) chapter of the book, I’ve clearly pointed out that the Greek translation of the Hebrew book (Bible) is based on an ancient Jewish deception/Forgery. We found out that [Mizraim], unlike the widespread Jewish definition/forgery, is a small and obscure village/town located along the ancient Caravan route (ancient spice road) in the south of ancient Arabia. Inside that [Mizraim] all the ancient Israelite stories took place including that of Joseph and Moses. But I got news for Mr. Alexis et al., if you keep viewing things only through your western prism (a regrettable thing for an Afro-American), you definitely won’t be able to find the truth regarding the origin of the Judeo-Christian faith and literature (dogma). By the way, African mythology and theology harbored much more elevated spiritual beliefs than the tribal and violent cult of the Israelites gallantly defended by Mr. Alexis. My dear Mr. Alexis et al. all your ideas and beliefs about the Israelite stories and dogma are simply based on a clever act of forgery and deception. The real Israelites didn’t sound or taste or even smell like anything you have been told (indoctrinated) since your early infancy till this very moment. The ancient Israelites are in fact one of the ancient Arabian tribes who made their living by plundering the ancient Camel Caravans and looting other tribes’ fortunes. They were no farmers (builders of civilization); they were war mongers (pirates of the ancient Arabian Desert) … the nowadays group of ISIL (Islamic State in Iraq and the Levant) is a close contemporary parallel. All the literature and the stories linked to the Israelites were deviously spawn up by their scribes to add fake legitimacy (divine one) to their looting and land grab in ancient Arabia. By celebrating and exalting the Israelite stories as divine and sublime stories, you will no doubt descend deeper into an ocean of delusion and forgery. Celebrating the stories of the tribal wars of the ancient Israelites is exactly the same as subscribing to the nowadays doctrine (Jihad) of ISIL (Daa’ish in Arabic). All those historians and acclaimed scholars have documented the story of Faraon and Moses as it happened in ancient Arabia. Moreover, Yaqut al Hamawi and the renowned Arab Historian Al Tabari (839-923 AD) have given us a rare insight into the true Exodus story when they revealed the name of the true Arabian Faraon. The so called Hebrew Bible might be a book of (crooked) ancient history, but the problem is that it is a book (regardless of the lies you’ve been told) of lost geography. My book is an attempt to relocate those Israelite stories where they originally belong; ancient Arabia and North Yemen. Cohesion is what the Biblical archeology in Palestine and Egypt is lacking till this very day. The reason for that is so simple; the Israelite stories never took place there. There is a plethora of fake (Zionist-controlled) archeological findings in and around Palestine (remember the fake ivory Pomegranate of Solomon). Those fake finds are intended to quench the thirst for evidence for millions of believers and Zionist zealots who subscribe to the Zionist claim of Palestine being the Jewish historical and Promised Land. One more thing that Mr. Alexis was irritated by is my research of ‘slavery practice’ all over the ancient Near East. After explaining that all the Israelite stories actually reflect a deeply ingrained culture of slavery, I said it was highly unlikely those stories took place in Egypt. If you (as a contemporary westerner) could relate to the culture of the Houthis of nowadays Yemen; then there is a slim chance you could culturally and historically relate to the ancient Israelites. To pick up once again on the allegation of Mr. Alexis that our book lacked any historical information or research; we would like to remind him we did the following. We have traced back the etymology of the word ‘Egypt’ and have presented historical evidence that Egypt had never been referred to as [Mizraim] or [Misr] as a native name for the land during the ancient and classical times. Among our historical evidences; the records of the Greek Historian, Herodotus who visited Egypt around 450 B.C. and the documented work of the Greek historian, Essayist and biographer, Plutarch 46 – 120 AD. Not once in the records of Herodotus did he refer to Egypt as [Mizraim] nor he mentioned any Pharaohs or Moses in the stories he heard from average Egyptians all over the Nile Valley. Also in his documents about ancient Egypt Plutarch, who compiled the Egyptian story of Isis and Osiris, is referring to Egypt as ‘Copto’ and not ‘Mizraim’. I could go on and on revealing all the valuable investigations and researches included in my book, but I prefer those who are interested to seek and find out the truth to go through them carefully in the book. Interestingly thirty years later King Ramses III waged a war (to the east of Egypt) against all of his foes in Palestine who had united with the Sea People against Egypt. Inscribed on the walls of his temple in Luxor; all the names of the forces/factions/tribes that had formed a coalition with the Sea People in Palestine/Canaan against his majesty King Ramses III. In addition to the many scholarly investigations cited in the book that unequivocally debunk that the Israelite stories took place in Egypt and Palestine, we did not stop that far. 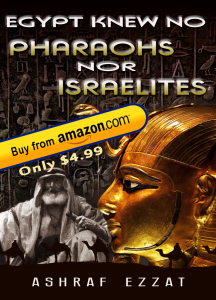 Find out why Egypt was never the land of the Israelites’ Exodus nor Palestine is their Promised Land. Wake up from two-thousand-year deception and delusion. This hypothesis collapsed with the evidences that camels were not used in southern and all Arabia, Levant, and Assyria at the times of Abraham and Moses. 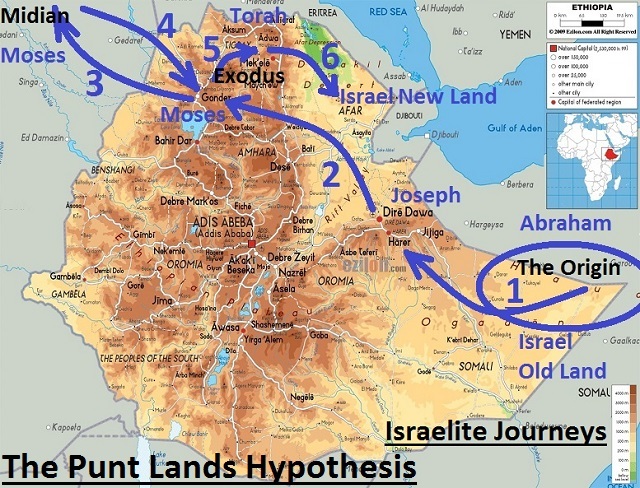 The hypothesis has been changed completely and turned to the “Punt Land Hypothesis”. It emphasizes the African Puntic origin of Abraham and the Israelite. Gondar is most probably the biblical Egypt; while biblical Israel is a desert region of Punt. Thanks Tarig for posting this. Very interesting, indeed. But if a false testimony or false interpretation gets repeated often enough and for long enough, it is accepted as true and is very hard to eradicate. I saw a TV program recently that asserted the possibility that the Ark of The Covenant was in a small monastery in Ethiopia. There can be no doubt that Ethiopia and Arabia played larger roles than we have been led to believe in the West. Possibly Uighurs among others. But, yes, they act criminally and in support of one another so they are a criminal association. I am sure the Promised Land is indeed Asir; and the Israelites were Yemenis. The Arab Israelite became Hebrew (Ebri) only after they mixed with the Aramaic Canaanites and others. Wished you could make a map with the old Arab names, the modern names and the way they were called in the bible. It would make your article much more comprehensive (one image –or map– shows more than a thousand words). My intuition says you’re right as far you deal about Yemen. But it is intuition, not fact … And a good map might provide the facts. I am trying to raise awareness and mobilize people, but the real work of discovery must be multi-disciplinary organized group actions.